The end of Miss Indonesia 2018 coronation night held on 22nd February 2018 at MNC Studios, Jakarta saw the crowning of Jawa Barat’s Alya Nurshabrina as Miss World Indonesia 2018. She will now go on to represent Indonesia in Miss World 2018. 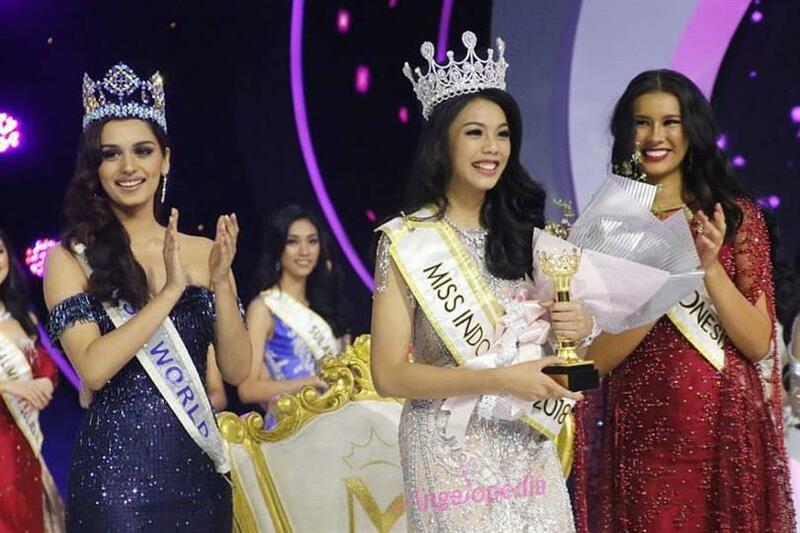 The lovely lady was crowned by her predecessor Miss Indonesia 2017 Achintya Holte Nilsen and reigning Miss World 2017 Manushi Chhillar of India. 21-year-old Alya Nurshabrina stands tall at 176 cm and is a graduate of Parahyangan University Bandung. Alya is actively involved in social activities in Indonesia and she wants to ripe her social activities through her “Beauty with a Purpose” project. One of Alya’s community services involves a project called “This Is Us- Youth Unite For Autism,” held by the Office of Youth and Sports Bandung 2017. She is also a volunteer at Sahabat Peduli Indonesia which teaches the art of recycling of garbage around the coast of Ngurbloat, Southeast Maluku in 2017. She has also won a beauty event in one of the leading magazines. The reigning queen Manushi Chhillar along with Miss World 2016 Stephanie Del Valle and Miss World 2017 continental queens Miss World Americas 2017, Andrea Meza from Mexico, Miss World Africa 2017, Magline Jeruto from Kenya, Miss World Asia 2017 from Korea Haeun Kim, Miss World Oceania 2017, Annie Evans from New Zealand, Miss World Caribbean 2017 from Jamaica, Solange Sinclair and Miss World Europe 2017, Stephanie Hill from United Kingdom graced the event with their presence.